Hearing is one of the five senses. It is a complicated process of picking up a sound and attaching meaning to it. The ability to hear is critical to understanding the world around us. Sound is air pressure waves characterized by the size of the wave, amplitude, and the how often wave peaks repeat, frequency. A voice is a complex mixture of many different sound waves of various frequencies and amplitudes. The ear converts the sound wave energy into electrical nerve impulses that the brain has learned to interpret as a tone, voice, or melody. The human ear is a fully developed part of our bodies at birth and responds to sounds that are very faint as well as sounds that are thunderous. Even before birth, infants respond to sound. The ear can be divided into three parts leading up to the brain – the outer ear, middle ear, and the inner ear. The outer ear consists of the pinna, or auricle, and the ear canal (external auditory meatus). The pinna – the part of the “ear” that we see on each side of our heads – is made of cartilage and soft tissue so that it keeps a particular shape but is also flexible. The pinna serves as a collector of sound waves around us, like a satellite dish, and focuses the sound waves into the ear canal. The pinna also helps in locating sounds above and below us. The middle ear begins with the eardrum, the tympanic membrane, at the end of the ear canal. The middle ear is an air-filled cavity, under normal conditions, which contains the ear bones and is connected with the mastoid cavity, a honeycomb of air cells behind the middle ear, and the linked to the outside via the Eustachian tube, which is a tube opens up behind the nose. The middle ear contains three tiny bones, called the ossicles. The ossicles are called the malleus (Latin for hammer), incus (Latin for the anvil) and the last stapes (Latin for stirrup). These three bones form a connection, called the ossicular chain, from the eardrum to the inner ear. The hammer, malleus, is attached to the eardrum. As sound waves hit the eardrum, the eardrum moves back and forth causing the malleus, and hence ossicular chain, to move in concert with the same frequency of the incoming sound wave(s). As a result, the sound wave is changed to a mechanical vibration. The last ear bone, the stapes, also known as the stirrup has a footplate that sits in the oval window, the beginning of the inner ear. The cochlea is a bony structure shaped like a snail, with 2 ½ turns, and filled with two fluids (endolymph and perilymph). The Organ of Corti is a complex ribbon-like structure the twists within the 2 ½ turns of the cochlea. The ribbon-like Organ of Corti is tonotopically organized, meaning tones or particular frequencies vibrate best at specified lengths along the ribbon. The ribbon will have the largest amplitude or height for a particular frequency, because of various physical characteristics along the ribbon. It has the highest amplitude for high tones, rapid frequency or treble tones, near the oval window and highest amplitude for low tones, or lower frequencies or base tones, toward the apex or end of the ribbon. The Organ of Corti is the sensory receptor inside the cochlea which holds the hair cells. The hair cells don’t have hair but rather tiny projections called cilia, which under a microscope can be creatively called hair-like. The hair cells are cupped by nerves which pick up any electrical change within the hair cell. The mechanical vibration energy from the movement of the stapes footplate in the oval window transfers the wave into the fluids of the first part of the cochlea. The vibrational waves in the cochlea’s fluids, in turn, creates a traveling wave along the Organ of Corti, which pushes or deforms the tiny cilia of the hair cells. The deformed cilia cause and electrical discharge in the hair cell which the nerves pick up. Individual hair cells respond to specific sound frequencies (pitches) because the wave along the Organ of Corti peaks at its location along the ribbon so that, depending on the pitch of the sound, only certain hair cells are stimulated and also only particular nerves attached to the particular hair cell(s). The nerves are tonotopically organized also. Electrical signals from the hair cells are changed into nerve impulses, called action potentials. Action potentials are electrical waves that conduct along the membranes of a nerve. The action potentials are sent out to the brain by the cochlear portion of the auditory nerve. The auditory nerve carries impulses from the cochlea to a relay station in the mid-brain, the cochlear nucleus. Very complex processing occurs in the mid-brain and other brain pathways that end in the auditory cortex (hearing part) of the brain. When describing hearing loss, we look at three categories: type of hearing loss, the degree of hearing loss, and configuration of hearing loss. With children, it is especially important to diagnose and treat a hearing loss as early as possible, which will limit its potential impact on learning and development. Hearing loss can significantly affect the quality of life for adults as well. Unmanaged hearing loss can have an impact on employment, education, and general well-being. Sensorineural hearing loss (SNHL) occurs when there is damage to the inner ear (cochlea), or to the nerve pathways from the inner ear to the brain. Most of the time, SNHL cannot be medically or surgically corrected. SNHL is the most common type of permanent hearing loss. 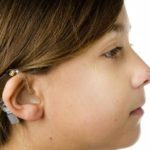 Hearing aids or Cochlear implants typically are helpful. Sometimes a conductive hearing loss occurs in combination with a sensorineural hearing loss (SNHL). In other words, there may be damage in the outer or middle ear and the inner ear (cochlea) or auditory nerve. When this occurs, the hearing loss is referred to as a mixed hearing loss. The degree of hearing loss refers to the severity of the loss. The table below shows one of the more commonly used classification systems. The numbers are representative of the patient’s hearing loss range in decibels (dB HL). The configuration, or shape, of the hearing loss, refers to the degree and pattern of hearing loss across frequencies (tones), as illustrated in a graph called an audiogram. For example, a hearing loss that only affects the high tones would be described as a high-frequency loss. Its configuration would show good hearing in the low tones and reduced hearing in the high tones. On the other hand, if only the low frequencies are affected, the configuration would show a poorer hearing for low tones and better hearing for high tones. Some hearing loss configurations are flat, indicating the same amount of hearing loss for low and high tones. Bilateral versus unilateral. Bilateral means hearing loss in both ears. Unilateral means hearing loss in one ear. Symmetrical versus asymmetrical. Symmetrical means the degree and configuration of hearing loss are the same in each ear. Asymmetrical means degree and configuration of hearing loss are different in each ear. Progressive versus sudden hearing loss. Progressive means that hearing loss becomes worse over time. Sudden means hearing loss that happens quickly. Such a hearing loss requires immediate medical attention to determine its cause and treatment. Fluctuating versus stable hearing loss. Fluctuating means hearing loss that changes over time—sometimes getting better, sometimes getting worse.